A home is summer barbeques on the patio spent with good friends and the peals of children's laughter coming from the back yard. It is winter evenings spent warming up together beside the fireplace with the smell of freshly baked cookies cooling in the kitchen. A home is where memories are created and where dreams are dreamed. It is where life is lived and where love resides. The folks at Scott Christopher Homes understand that a home is in so many ways the most important investment you will ever make. Let them show you how you can have a custom built home or renovate the home you always wanted but never knew was within your reach. Because everyone deserves the home they dream of. Scott Christopher Homes has over 30 years experience building new homes and cottages, performing renovations and room remodels, as well as creating fine custom cabinetry and providing year round home care and maintenance. They are passionate, experienced craftsmen who commit fully to every detail of every project regardless of its size, style, or location. The professionals at Scott Christopher Homes are dedicated to building and enhancing every home as though they are fashioning it for their own families. They partner with architects, residential designers, and homeowners to forge a seamless building process that allows for the possibility of on-site fine tuning and architectural tweaking as each home takes shape. With the quality of workmanship and the attention to detail that clients have come to expect. Scott Christopher Homes not only works for you, they work with you. Through the pre-construction services at Scott Christopher Homes, they are able to add efficiencies and instill value early on during the building process. Involving your contractor early in the process will ensure that project objectives and goals are met and exceeded. Recognizing that every client and every project is unique, Scott Christopher Homes can be flexible with their services and are able to find the perfect method to accommodate individual needs. If you are considering building in a particular area, let them know what you are looking for. In addition to an internal database of unlisted homes and properties, they also work with the area's top real estate professionals. Before a shovel hits the dirt, the team at Scott Christopher Homes works to identify, up front, all the costs you can expect for your project. Their True Cost Proposal properly aligns client expectations with resources needed and empowers clients to plan accordingly. From the very beginning, clients can expect full disclosure from them as they leave nothing out. Their estimates end up with true costs represented. They break down the cost of virtually every aspect of a project showing line items for everything from excavation to house cleaning, along with a construction timeline for each phase of construction. They facilitate the planning process by providing budget and decision making flexibility. Once they understand the true budget required to execute plans, the team at Scott Christopher Homes can work together to value engineer the project to meet your financial goals. Scott Christopher Homes offices are located in Grand Rapids and Pentwater, but they can build and renovate dreams wherever life takes you. Their company has assembled a vast network of talented and dedicated artisans, craftsmen, and laborers, while perfecting flexible and efficient construction systems. This allows them to build amazing homes and provide impeccable service anywhere. 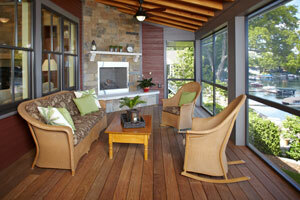 They specialize in building and renovating custom homes and cottages that will be enjoyed for generations to come. If you're considering building a new home, please call Scott Christopher Homes and let them walk you through the process. You deserve the best, and they can make that happen.